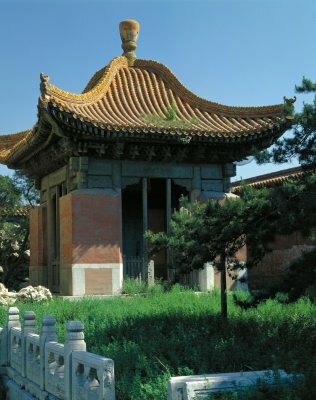 The Belvedere of Literary Profundity (Wenyuan ge) is a bibliotheca behind the Hall of Literary Brilliance (Wenhua dian). It was constructed in 1776, the forty-first year of the Qianlong reign (1736-1795), modeling on the renowned Belvedere of Heaven's First Creation (Tianyi ge) in Zhejiang province. The two-storey pavilion is covered by black glazed tiles on the roof trimmed with green glazed tiles. These colors render the pavilion solemn and elegant. Meanwhile, it was hoped that the color black, which betokened water in the Five Primary Elements, would guard the building against fire. Books preserved in the Belvedere included Complete Library of the Four Treasuries, and Imperially Approved Collection of Ancient and Modern Books. Since the Qianlong reign (1736-1795), aside from the emperor, officials and grand secretaries were also allowed in to consult the books preserved here.